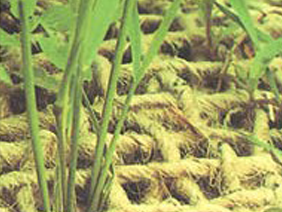 Jute Mesh is a biodegradable open weave erosion control blanket suitable for short term erosion protection to batters and open drains where light water flows are expected. Jute Mesh helps retain moisture and allows water and light infiltration to encourage vegetation growth. Jute Mesh shall be pinned in place using Global Synthetics Retaining Pins available separately. Generally, two pins should be applied per square metre to fix the blanket to soil surface. For further information please refer to Technical Downloads located on the right.